The OMEGA™ PCM series converter modules facilitate conversion of a 4 to 20 mA output to an on/off time proportioning output. The modules mount directly to the input terminals of an SSR. Screw terminals are provided on the converter of the 4 to 20 mA control signal. The SSR’s power section connects in standard fashion to the line and load. 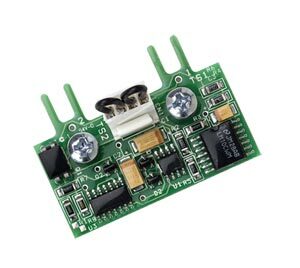 The PCM module with a solid state relay provides a rectangular shape, time proportional (zero-fired) control signal to the load. Thus, the average power to the load is proportional to the 4 to 20 mA input signal.